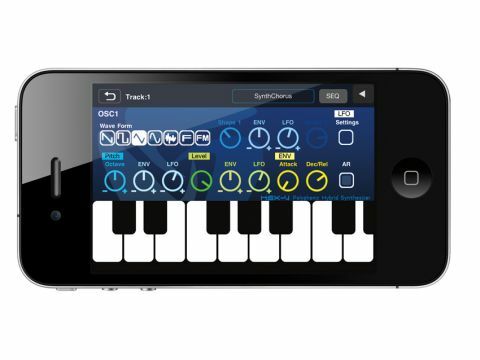 At this price, Xenon is a good buy for budding iOS music producers. Lots to play with. It sounds great. Efficient workflow. Takes a bit of getting used to. LImited import/export options. Xenon is a software studio with just enough features for you to be able to create complex electronic arrangements on your iDevice. There are three different synthesizers, a drum machine, a five-track song sequencer, mixer and a single effect: a delay processor. iceGear's Argon synthesiser has received a lot of praise for its sound quality, and the company's expertise has been carried over into Xenon's trio of synthesisers. This is most apparent in the ASX-1, a virtual analogue monosynth with a pair of oscillators, multimode filter and built-in pattern sequencer. You get independent ADSRs and LFOs for amp, filter cutoff and oscillator pitch (the latter LFO can be modulated by its own ADSR). Xenon's second synthesiser, PSX-4, is a PCM offering. It's architecturally similar to the ASX-1, but here the lone oscillator is able to draw upon any of the 112 sampled instruments. There are plenty of bread 'n' butter to be found in that collection, but we do wish we could bring in our own samples. The HSX-4 polyphonic hybrid synth is our pick of the bunch, featuring a pair of oscillators that can tap into VA, FM, formant and PCM synthesis. The independent LFOs and ADSRs found in the ASX-1 synth rear their heads once again, as does the pattern sequencer. Rhythmic duties are handled by the six-track PRX-6 drum machine. Any of 185 samples can be loaded into the six pads and sequenced via the pattern sequencer. You have control over pan, level, pitch, attack, decay and velocity level. Each instrument's patterns can be arranged in the Song Sequencer and mixed using the five-channel mixer. You can adjust track level, panning and FX sends. It's simple but effective stuff. Songs and patterns can also be exported as WAV files or copied to the clipboard. Xenon provides an awful lot of power for a very fair price, and most importantly, it also sounds fantastic. It takes some poking around to ­figure out where every function is stashed away, but once you're familiar with it, it o­ffers an e­­fficient compositional environment. We would really like to see more import and export options (MIDI ­files? Sample import? Resampling? ), but at £2.99, we're not going to complain too loudly.